Wesley with help of the Manawatu Cyclones women's players, conducts a series of catch and pass drills. 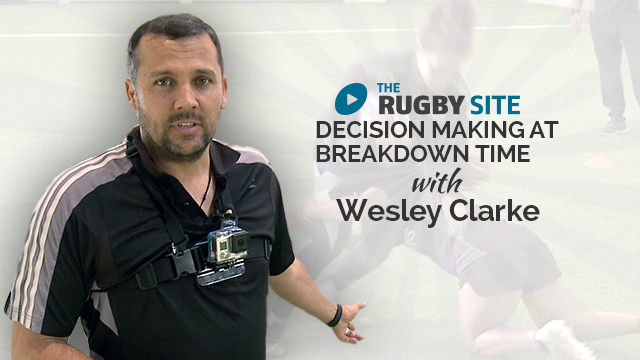 We sat down with Wesley Clarke and asked his opinion on a number of women's rugby topics. Enjoy! Awesome stuff on fundamentals Wes! Love it. Great fundamentals for any level of play for men and women. Clearly explained and illustrated. Thank you! @3.28, loved Wesley’s ‘permission to fail’. This is perhaps the best explanation of the ‘tricep punch out’ passing revolution that I’ve seen. Very good teaching really gives newer coaches the idea of what we should be doing at training, teaching the game! Great Drill. Also teaches draw and pass, decision making, reaction time, running at pace and communication. Wesley’s questioning of the players is great and makes the girls accountable. I use this drill regularly, you can develop this to do all your passing skills, using large numbers. Really good breakdown of basic skills. As a US university coach who is constantly getting players new to the game I would like to have more videos of Wesley Clarke on the site. Great session. Clear and precise coaching points and good progression through the session. Can’t wait to try it on my u10 team at the weekend! Thanks Wesley awesome sessions. Great clarity and attention to detail. Lot’s of great take aways not just on the what to coach but also how to coach. Would be great to see how Wesley builds on these fundamentals. Outstanding stuff.Clear instructions,implementing them in our club training. As someone who is just starting to coach women’s rugby 7’s I found these videos very helpful. Any help with coaching women in particular in the 7’s game would be great. Awesome stuff, really awesome. Learnt a lot from it and looking forward to implementing them in my coaching. Outstanding instruction and very relevant to new players who are learning at any age. Great series of videos, nice to see the players being challenged via questioning. More videos from this coach would be very helpful. Thank you coach. Great info. Hi! Very good series. Just a quick comment about the tackler going back on his/her legs, new law forces him/her to enter through the gate like any other defensive player. Interesting insights from a great coach. I’ ve got an enduring memory of Wes composure on the sideline during womens national finals. Professional. Spot on. Thank you very much for these! Superb articulation of how, why and the impact of real basics. Can be used well in all levels mens and womens. a basic skill coached very well. would like to see more coaching sessions from this coach. Muy buen complemento de la serie catch and pass de Wayne Smith. Un enfoque más completo de posicioes corporales y uso de los musculos del brazo, etc. !